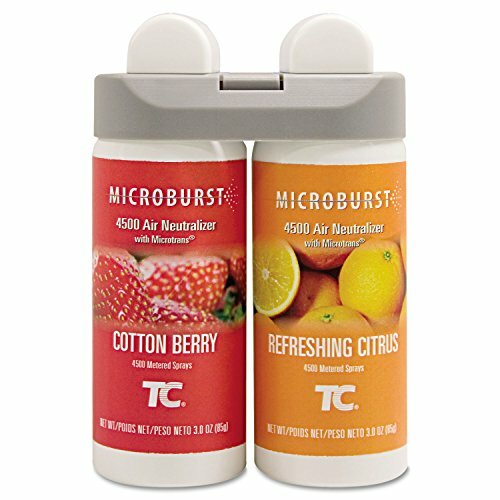 Rubbermaid Commercial Microburst Duet Refills, Cotton Berry/Refreshing Citrus, 3oz, 4/Carton by Rubbermaid Commercial at Home Products Hut. MPN: RCP3485952. Hurry! Limited time offer. Offer valid only while supplies last. Rubbermaid Commercial Microburst Duet Refills, Cotton Berry/Refreshing Citrus, 3oz, 4/Carton Dual fragrances were designed to complement one another. Rubbermaid Commercial Microburst Duet Refills, Cotton Berry/Refreshing Citrus, 3oz, 4/Carton Dual fragrances were designed to complement one another. Each formulation combines high quality oils and MicroTrans, a proprietary air neutralizer, to eliminate malodors rather than simply covering them up. Scent: Cotton Berry/Refreshing Citrus; Physical Form: Spray; Application: Odor Control; Capacity (Volume): 3 oz. Manufacturer's limited one-year warranty.